Our dedication to community involvement starts with education. Not only are we serving Vertical Roots lettuce on campus, but we’re providing opportunities for students to gain hands on experience. We’re proud to be involved in teaching and serving our youth. Changing how food is grown is amplified by our ability to distribute produce within 1 day from harvest to plate. You’re getting the freshest produce possible while decreasing the harmful effects that distribution can have on the environement. Win, win! As a sustainably-focused company, we’re working to reduce our carbon footprint. Our seeding plugs are made from coconuts, which pigs love! And our lettuce that isn’t store quality is enjoyed by local people and animals in need. 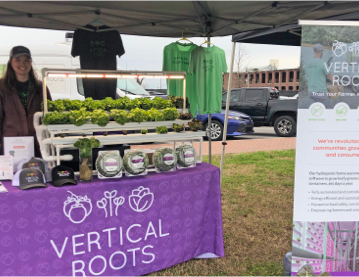 We’re continually out and about in the community to raise awareness around our products, our growing methods, and our mission. Be on the lookout for us in your neighborhood grocery store or at the next big event around town. We're always on the look out for companies that align with our mission and values, together we can create a larger impact.